In our 12 Questions blog series, we feature interviews with someone from the crowdSPRING community. For these interviews, we pick people who add value to our community – in the blog, in the forums, in the projects. Plainly – activities that make crowdSPRING a better community. Be professional, treat others with respect, help us build something very special, and we’ll take notice. We’re very proud to feature Tiffany Silverberg (crowdSPRING username: TiffSilverberg ) today. Tiffany lives and works all over the United States. I’m a marketing writer and consultant – which means I work with small businesses and entrepreneurs to help them develop their brand and tell their story. I work from home, for myself, which frees me up to travel and explore! I move often with my husband’s job so I love having the chance to get to know new communities and the businesses that drive the local economy. 2. How did you become interested in writing? I’ve always been completely obsessed with languages and the ability to communicate. I grew up moving a lot – much as I do now – and had the chance to learn Cantonese and Spanish. When I went to college, at the University of California Berkeley, I s tudied linguistics, with research in language development among Deaf children. I also took Danish linguistics, Latin, conversational Spanish, and of course American Sign Language classes. All that random knowledge sort of coagulated into my job now – which to me is still all about communicating. 3. Who/what are some of the biggest influences on your writing? All the great copywriters that produced the retro magazine ads of the 1960’s and 1970’s really inspire me. It was an age when words were respected and manipulated to say the cleverest things. I keep old ads all around my desk. On a more philosophical level, I’ve always adored Jane Austen’s ability to draw out the nature of women in her books in a way that we fellow women can both appreciate and learn from. I want my story telling to be the same way. Lighthearted, but thoughtful. 4. Please tell us about your favorite projects. Really practically, I love doing projects that force me to pull out a few thesauruses and dictionaries and delve into the etymology of words. I love to swim in words. But from the clients’ perspective, if I had to choose one project, it would probably be bios. I love helping my clients see themselves in a new light. 5. What types of writing interest you the most? Copywriting is probably one of the most fascinating to me. It’s so full of spark and creativity – and yet at the end of the day, it’s about selling and you have to stay within the parameters. It’s like a puzzle. 6. 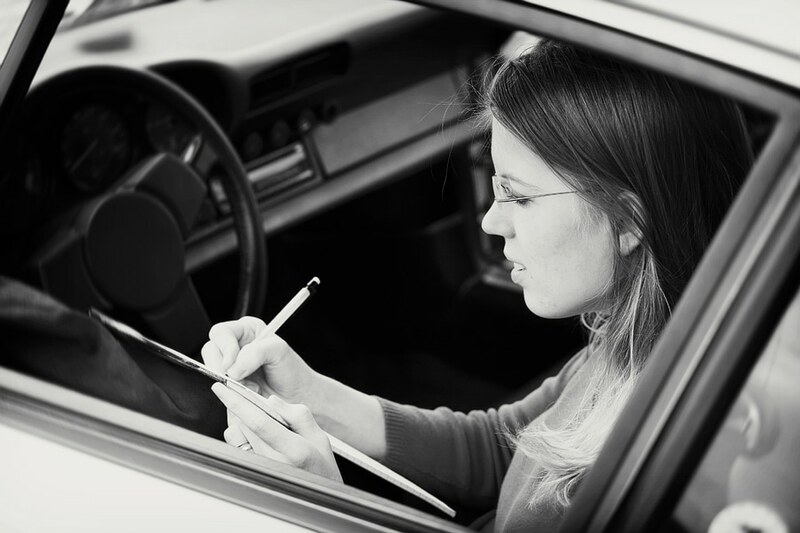 Do you do your best writing in a Porsche 911? Well, I think everyone around me would prefer that I keep my eyes on the road, rather than on my paper when I’m in my car, but I do love driving fast down country roads – and that retro style of ad writing does rush in when I’m there. 7. What kind of on-line resources do you use? Oh, http://www.etymonline.com/ is probably my favorite. Quick resource for Latin and Greek derivations. There are also some great lists of roots, prefixes, and suffixes that you can pull up and muse. When I’m trying to create new words for companies and brands, it’s fun to mull those lists and just try the sounds. 8. How do you promote your work? Mostly through my website, TiffanySilverberg.com, and on Facebook and Twitter. 9. Please describe your typical work day. It normally starts with a cup of coffee or three while I peruse Facebook, Twitter, Pinterest, and emails. Then I delve into client projects all morning, through lunch. Then Crowdspring projects until dinner time. 10. What is your favorite book? That’s like asking a painter their favorite color – it depends on the situation! The novel I’ve read and marked up the most is Pride and Prejudice. But I spend a lot of time with dictionaries, word usage books, and linguistics books – and I can’t choose just one. 11. If you weren’t writing, what would you be doing? In college, I occasionally dreamt of doing field work – unearthing and preserving languages in the jungles or deserts of somewhere… and sometimes think that’s what would have happened if I hadn’t taken this path… but it would have involved words, language, and stories. 12. What do you do with your free time? Knitting has become my recent interest. It fascinates me what can done with string and needles. I also love to decompress in the kitchen, experimenting with spices.